The U.S. experienced a positive labor report for February as the nation continued to move toward a strong employment situation, according to the Bureau of Labor Statistics. Not only did the overall employment rate drop, but positions were added to a variety of sectors. 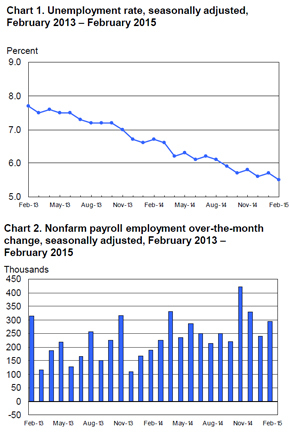 The unemployment rate decreased by .2 percent in February to 5.5 percent. Youth unemployment, a point of concern for the nation, experienced a positive shift as well, dropping by 1.7 percent to stand at 17.1 percent. The number of residents dealing with long-term unemployment remained relatively unchanged at 2.7 million. The civilian labor force participation rate also changed very little, coming in at 62.8 percent. Overall, the country added a total of 295,000 jobs during February, exceeding the current average monthly gain of 266,000. Food services saw a significant hiring increase, adding 59,000 jobs. The professional and business services sector grew by 51,000 positions. Most of these new jobs were in the technical consulting services, computer systems design and architectural engineering fields. The construction industry grew by 29,000 positions, most of them in the form of specialty trade contractors. Healthcare services added 24,000 jobs, many of them focusing on ambulatory care and hospitals. The transportation and warehousing sector expanded by 19,000 jobs, mostly couriers and messengers, while the retail industry continued its upward employment trend by adding 32,000 positions. 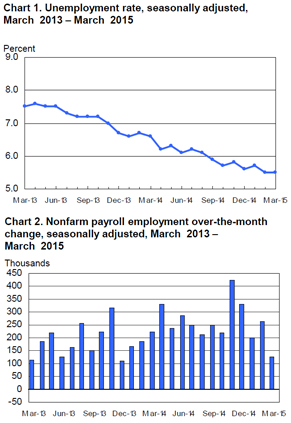 Manufacturing also saw a notable increase of 8,000 jobs. Industries that saw little change during the month of February include information, financial activities, wholesale trade and government. The mining sector saw a slight loss in its workforce. According to the report, average hourly earnings improved by 3 cents to the current average of $24.78. Despite this only slight improvement, the U.S. dollar reached its highest value in 11.5 years against a number of currencies, reported Reuters. This general positive growth could inspire the Federal Reserve to hike rates come June, explained the source. Although the Fed has kept overnight lending rates close to zero since December 2008, the strength and potential present in the labor report could be grounds for increases. First Friday Preview March 2015: What is your office space engaging? Over the last few years, the image of desirable office space has changed considerably. The goal of rising through the ranks to earn a big corner office is increasingly becoming a thing of the past, as many companies shift from designated offices and cubicles to open workspaces. This transformation reflects a growing trend toward work environments that are more conducive to open communication and collaboration between team members, as well as a focus on condensing office space to reduce rental expenses. It is no longer acceptable to dread coming in to work every day. Top candidates expect to work hard, but they want to have fun doing it, and enjoy the people with whom they work. The new concept of office space isn’t just taking hold at technology and marketing firms, or hip restaurants; more conservative industries such as banking and education are increasingly adopting this model. Despite all the benefits of this modern work approach, it’s not for every company, nor for every potential hire. As the improved labor market prompts more companies to hire, more attention will need to be placed on what the office environment communicates about the company culture and employee engagement, and if these messages are being communicated effectively. Baby Boomer executives are not immune to these changes. In many companies that prefer an open office environment, the C-Suite is also finding it must deal with smaller work spaces, if not complete elimination of designated office space altogether. Ultimately, with retention and employee engagement being some of the biggest challenges facing employers today, office space is just a part of the message that organizations can communicate about company culture. Amenities, company-funded perks and team interaction, both inside and outside the office are additional features that have the ability to tell a story about the cultural health of the organization. 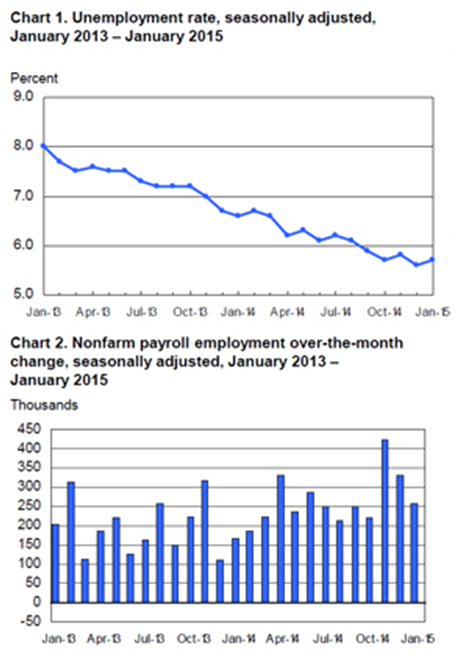 2014 came to a strong close, with U.S. employment reaching a 12-month average of 246,000 new jobs and unemployment dropping to 5.6 percent. Confidence is growing in the labor market and as a result, many companies plan to hire throughout 2015. With all of this positive news on the job front, employees might have expected to see upward movement on salaries and wages. However, most recent surveys and reports indicate employers are planning modest pay increases, comparable to what was awarded in 2014. In light of this, how will companies retain their best talent, when below-market salaries are one of the top reasons employees decide to leave? According to Towers Watson commentary regarding their 2014 compensation survey, the projected 3 percent pay raise in 2015 is a bit disappointing as the average employee is barely keeping ahead of inflation. However, we realize that many companies are being conservative with pay, because they are still concerned about the stability of the economy and the labor market. Despite this reality, the most recent MRINetwork Recruiter Sentiment Study, found that although improved compensation and benefits are a leading factor for candidates considering changing jobs, the top reason that candidates leave is because of clear advancement opportunities elsewhere. Companies may be at greater risk of losing their top performers, but the wage issue can be averted by focusing on career tracking, mentoring and training programs. After all, advancement to a more senior role not only connotes greater responsibility, but also higher pay, or at least the long-term potential to earn more. Advancement opportunities and career-pathing will additionally become more important as Baby Boomers retire and Millennials become the majority in the workplace. This generation is especially focused on gaining experience that can be leveraged to make the next career step, which is why job changes after 2-3 years are more common. Companies that provide the mentoring and training that Millennials crave are not only working toward retention of their brightest talent, they are grooming the future leaders of the organization. Brainstorm how your organization can develop these programs, if they don’t already exist. Consider how they can be leveraged to support various groups within your workforce including minorities, women and junior to mid-level management candidates. Begin discussing internal mobility programs during the interviewing and onboarding process. Promote the programs through multiple internal and external channels to create stories about employee advancement within the company.